Since 2006 the Continuity Forum has been working with a number of agencies and bodies to develop a deeper understanding and relevance of the Risk and Business Continuity professions applies to one of the biggest issues of our time... Climate Change. This portal is part of that effort. Through these pages we'll be providing you with support and resources, as well as asking for your insight and ideas, all geared to create a more connected and effective approach to the planning and priorities needed to address the effects of Climate Change. This has become an important policy matter to us and the chart below illustrates why. As you can see the average trend line is indicating an increase in events of of over 300% in just 10 years and our profession in is the frontline dealing with the impacts every time. You will find information and resources from government and leading thinkers on the effects and risks we are addressing and we'll be running regular Events, Webinars and Workshops to help develop your skills and understanding. We have also formed a special Climate Adaptation Policy Working Group comprising interested professionals and organizations to help us steer our efforts and contribute to the developing activities and action. Today most of our leading companies and government departments have built some measure of resilience to disruption by applying the principles Business Continuity and evolving improvements to Risk Management techniques. Standards have developed and evolved over time to lead us to a point where the International Standards Organization (ISO) now has a formal certification standard in place (ISO 22301), enabling organizations around the world to clearly demonstrate genuine capability. Business Continuity Management has transformed into a mainstream activity bringing benefits to millions and saving organisations and indeed economies billions annually. Over the past 20 years, business continuity has grown from a niche, specialist activity into a well formed, structured discipline adopted by thousands of organizations around the world. The skills and experience developed byprofessionals working in the field over this time has been vital in helping organisations and communities become more and more resilient. 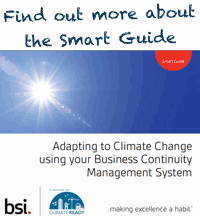 Business Continuity works because it delivers practical solutions to real world problems. Whether the challenges being faced and overcome are at a local, national or even international level, the capability of business continuity to deliver has been tried and tested many times over and BCM has consistently demonstrated real benefits for businesses and our communities. What we have learnt is that whilst we cannot eliminate risk, we certainly can manage and mitigate many of its effects through considered planning and the application of industry good practice. What, though, of our sectors future? Is there more we could or should be doing? Well we think so … and this is what the Climate Adapatation Programme is about. we believe that what we have learnt as a profession in dealing with Extreme weather, Supply Chain and a host of other disruptions offers very valuable insight and real capability that can directly help deliver change and contribute to a better and more resilient future for us all . For the past few decades there has been the growing realisation that our Climate is changing. Today the overwhelming consensus is that Climate Change is a very real threat and very likely to affect all of us. You can start to contribute right now by contributing to our baseline Research by clicking the link below. The evolution of Business Continuity Management continues and will adapt to met all emerging threats, constantly improving with new insights, tools and resources developing every year. Adoption of the discipline will continue to increase globally and more and more organizations of all sizes are looking to gain the benefits, build capabilities and demonstrate their corporate responsibility. Twenty years ago few had BCM plans, but today any serious organization considers them essential. We know the Climate is changing and that there will consequences. If our industry starts the assessment and adaption process now the benefits will be clear. Staged investment can build capability and mitigate events earlier and in a more co-ordinated way, budgets can be more easily managed and industry thinking refined to deliver cost effective solutions. It makes sense professionally and financially to be ahead of the curve. 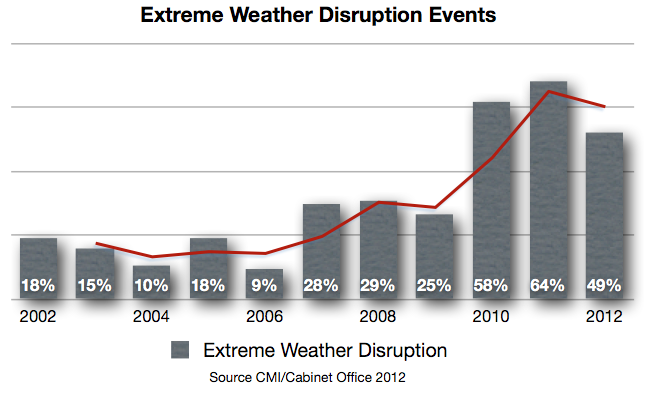 While the risks that come with Climate Change are potentially severe many business opportunities will also develop. Global spending on Climate adapatation is increasing and will likely accelerate as governments and business invest as part of their Climate Adaptation Planning. The result will be a need for information, expertise, solutions and resources focused on the disparate challenges faced around the world. This is an emerging global market with a local impact. Climate Adaptation is the response to Climate Change and brings up and down sides. Preparation is vital; our sector has huge experience in dealing with the effects of Weather and is, in our opinion, perfectly placed to manage how organizations should be adapting to the effects of Climate Change. If you would like to know more or get involved please contact us HERE!